Notes: Exhibit title: Naval group - Larkin G. Mead, Ames Manufacturing Company, Chicopee, Mass, Exhibit #146, Memorial Hall/Art Gallery, Bldg. #101. Notes: Sculpture of three men around a cannon. One man is seated on top of the cannon, one is peering around it on the left and the third is standing erect with a telescope in his hand. All are in navy dress. Erected outside of Memorial Hall. 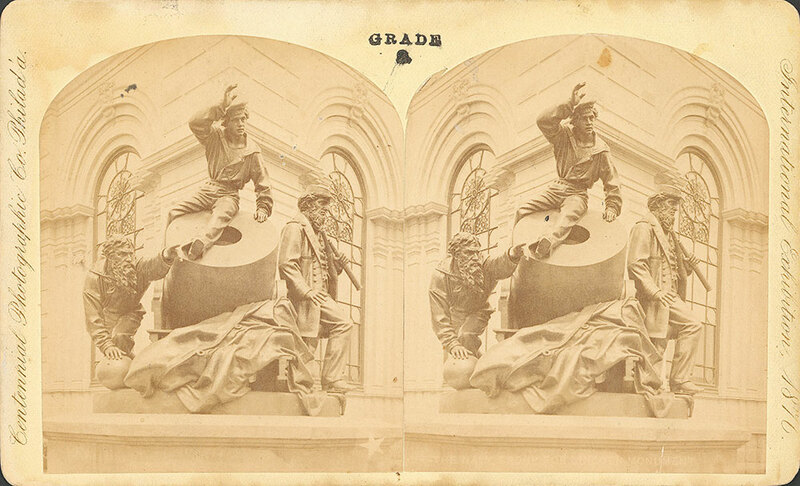 Notes: The sculpture was made for the Lincoln Monument in Springfield, Illinois. Notes: Title on label: The Navy group for Lincoln Monument. Mead, Larkin G. (Larkin Goldsmith), 1835-1910.